I'm not sure who reads this blog. Maybe no one outside immediate friends and family. But I suspect a few fellow bloggers, media types and brewery people click in here from time to time. My guess is there aren't a lot of casual beer fans reading this or any other blog. Most of us who write about beer, paid or unpaid, have Google alerts that provide a constant flow of information related to craft beer...grist for the mill, as it were. It's easy to set one of these alerts up and an efficient way to get regular updates on what's happening in beer land. But I digress. 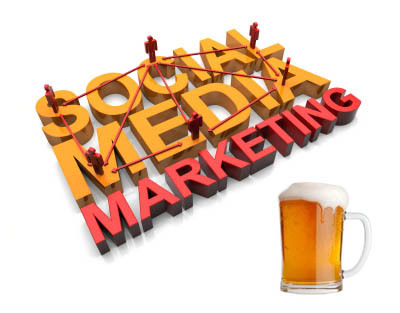 Yesterday, my Google alert delivered a link to a story confirming what I already knew or suspected about craft breweries and social media: craft breweries lean heavily on social media for promotion and advertising. There's a big reason for this, which I'll get to, but there's a general point I want to make first. Almost all businesses are trying to figure out how to use social media (Facebook, Twitter, YouTube, Yelp, blogs like this, etc.) to build their brands and increase revenue. This is happening at a time when the power and reach of traditional media (TV, radio and print) appears to be diminishing in relation to its cost. Of course, some businesses aren't great fits for social media promotion...likely because they have a product that has zero appeal on the open market. A company that makes smart bombs, for instance, may be a poor fit for social media. You get the idea. Craft beer is on the flip side of the coin. It's a product that is sold to the public and, more importantly, there is a growing segment of the customer base that is quite rabid about the product. This is an ideal setup for social media because rabid customers can be used to draw in additional fans via word-of-mouth advertising. In a nutshell, this is the heart of social media advertising. Which brings me back to craft breweries. And why they are leaning on social media. They're doing it partly because they see the value; more importantly, they're doing it because they can't afford to promote and advertise in traditional ways. Budweiser and MillerCoors spend close to $1 billion a year to promote beer that is essentially undrinkable. Craft brewers have a quality product, but shallow pockets. Why am I bringing this up? Because many craft breweries do not do social media well. They aren't alone in doing social media poorly, admittedly. One of the mistaken assumptions with respect to the social media concept is that anyone can do it. Someone who works in a small brewery and knows something about the web and computers is likely involved in running the social media program. What's wrong with that? 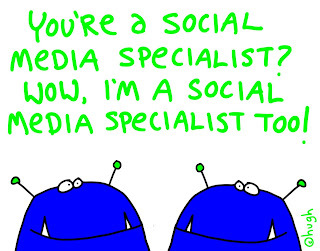 The problem, contrary to prevailing opinion, is that running a successful social media program requires communications skills, knowledge of the medium and planning. Back when traditional media was king, advertising messages were filtered. There's no such thing with social media. Everyone is a prospective expert. Some of the results: disjointed posts, spelling and grammatical errors, lousy (usually dark or blurry) photos, poor quality video, too many frivolous posts or too few posts to be relevant. In short, bad social media presence. I see it every day on Facebook and Twitter, arguably the most powerful sites. Look, I know social media is evolving and businesses, including breweries and pubs, will adapt. One of the adjustments they need to make to maximize their social media presence is go pro. They need people who can write effectively, take decent photos and think strategically when it comes to creating a coherent, branded, social media presence. Sure there's going to be a cost. But this work is too important to be farmed out to an employee, whether it's the owner or a dishwasher, just because that person thinks he or she is an expert. It just ain't so. Great post. Some of my favorite breweries to follow aren't my favorite breweries to drink. It's based on the high level of interactivity the provide via their social channels. It's these little interactions that could make/break a loyal fan base. I agree. Some of my favorite places to go don't have great social media personas. Some of my least favorite places do. It's very uneven. I think understanding of the social media channel is evolving. Businesses (including craft breweries) that are doing it well are putting significant effort and expertise into formulating what they do. Those doing a poor job aren't. Great post! Would you mind checking out my company on Facebook at https://www.facebook.com/TurboChill? I think you would actually love our product it is revolutionizing the way draft beer is poured. We just had a tailgate event yesterday at the Steelers game and we went through six kegs, and the last two kegs were kicked in 20 minutes! Our main website is www.TurboChill.com.